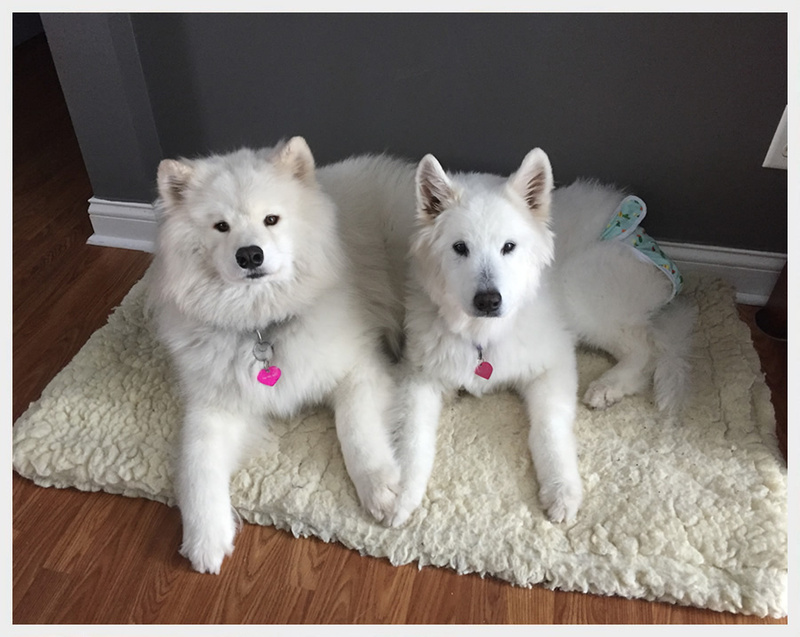 St. Louis Samoyed Rescue is an all-volunteer organization dedicated to the rescue, rehabilitation and placement of Samoyed dogs into suitable new homes. St. Louis Samoyed Rescue promotes responsible dog ownership by educating the public in the selection, care, and training of all Samoyed dogs. Please visit the American Kennel Club and the Samoyed Club of America to review breed descriptions and qualifiers. 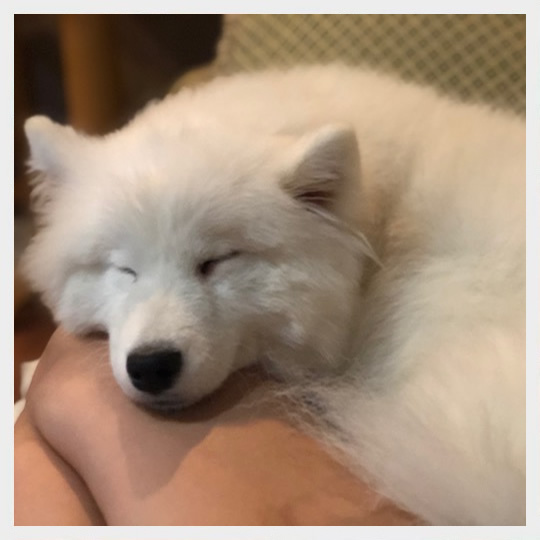 Our Board will determine to the best of its ability that any Samoyed entering Rescue will be in substantial compliance with the AKC and SCA descriptions. We exist to preserve, promote and protect all Samoyed dogs. We need to find perfectly matched homes for Samoyeds in need. We are also looking for temporary foster homes that will aid us in matching homes and Samoyeds ensuring a perfect fit. Belle and her sister, Sugar came into SLSR in December 2018 through a shelter in Indiana. They were a neglect case, and man, you sure could tell! Belle was estimated to be 9 years old. She had to be shaved due to mats, feces, and urine caked in her coat. She was underweight and appeared to have some urinary track infections. Belle went into her foster home but continued to have urinary issues. Unfortunately we found that Belle has bladder cancer. 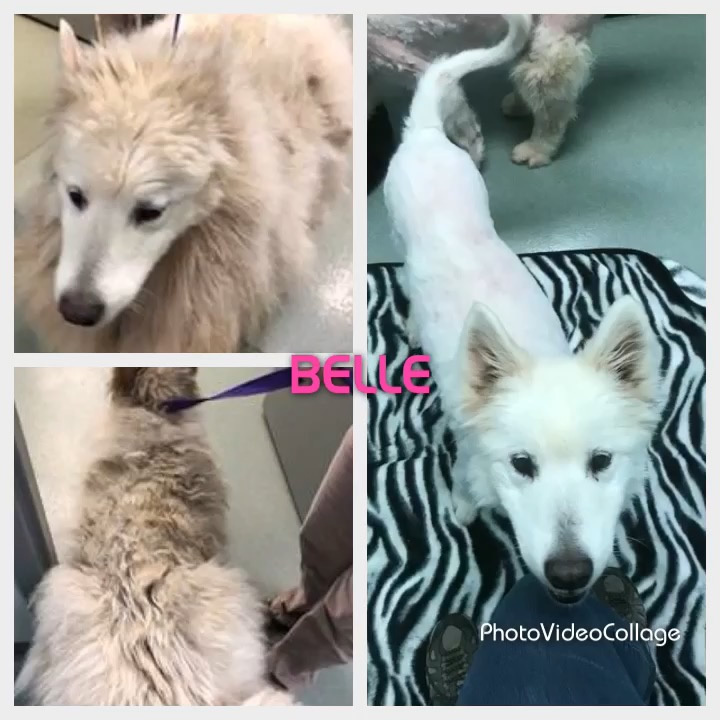 After several vet visits including a specialist in St. Louis and then to Michigan State University vet hospital, with her new foster mom, we learned there was not much we could do for sweet Belle. Her bladder cancer is terminal and has appeared to spread. So, we decided she will be a permanent foster and we will love and spoil her as much as possible! 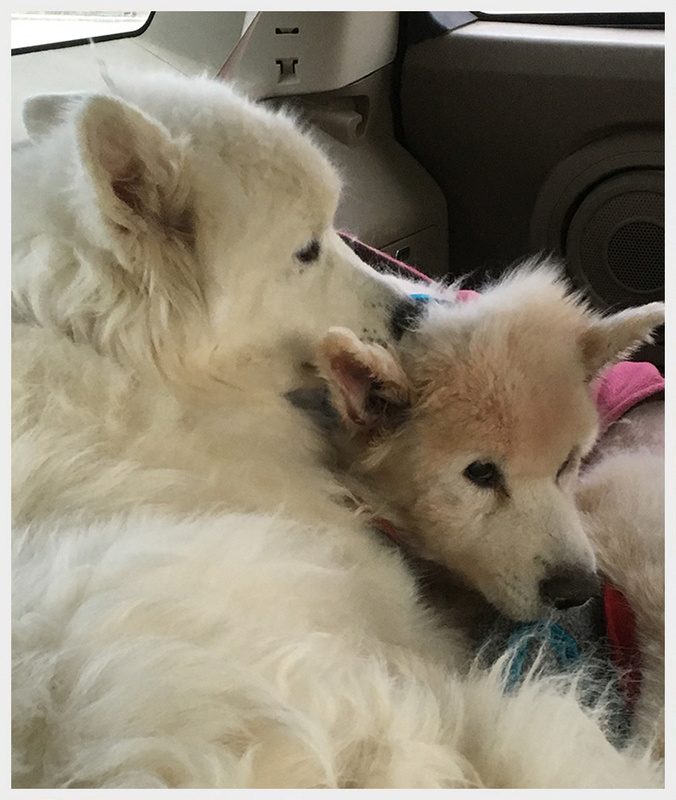 She talks to her foster mom with her soft woo-woos, she is learning to play with her Samoyed sister Shelby (also an SLSR alum), she has figured out she LOVES dog beds, and going on walks is her absolute favorite thing to do! Belle and Shelby are often mascots of SLSR’s Yankee Candle Fundraisers, so check out our Facebook page for pictures of them with their favorite Yankee Candles! Sugar and her sister, Belle, came into SLSR in December 2018 through a shelter in Indiana. They were a neglect case, and man, you sure could tell! Sugar was estimated to be 11 years old. She had to be shaved due to mats, feces, and urine caked in her coat, she had terrible ear infections that were starting to rot her ears, and horrible arthritis. We were able to get her ear infections and arthritis under control and she went to her foster mom in Canada. Unfortunately she continued to have some issues and had to have her tail amputated. She now has a little nub! Her foster mom fell in love with Sugar and Sugar became a foster failure! 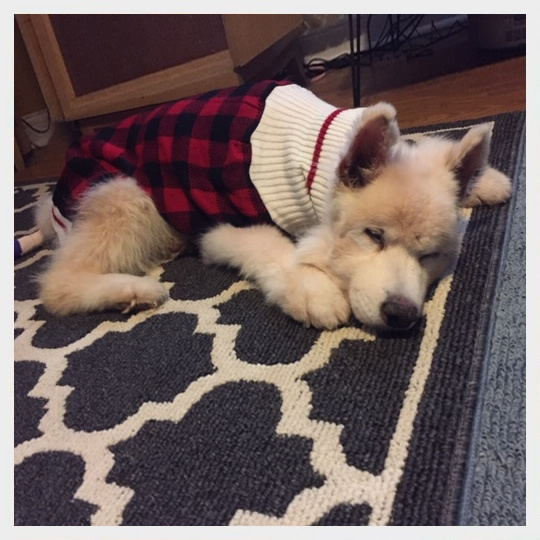 Sugar is now living in snowy Canada with her Samoyed brother, Manny, and her hooman mom! She loves bouncing around her backyard and learning to live inside for the first time in her life! She shows up on our Facebook page from time to time, so check out our page for more updates! Mimi came into SLSR from a central Illinois shelter in the Summer of 2018. She got to ride with several Samoyed rescuers on a transport over to SLSR. We were told by the shelter that her vision was not great, and she may have some eye issues. We got her right into the vet and some eye specialists. After lots of phone calls, board discussions, and vet opinions, we found out that Mimi is blind in one eye and has a very, very limited amount of vision in her other eye, but she may be able to see shapes of some sort. The vet staff fell in love with Mimi (not surprisingly!) and one of the vets asked to foster her while she was in their care. The next thing we knew, one of the vet techs asked to adopt Mimi. What a perfect pair! She takes Mimi to work with her every day, so she is able to give Mimi her eye medication, which is needed multiple times a day, and if Mimi has any additional eye issues, she is in good hands! Mimi lives with her black lab brother and her hooman in St. Louis. 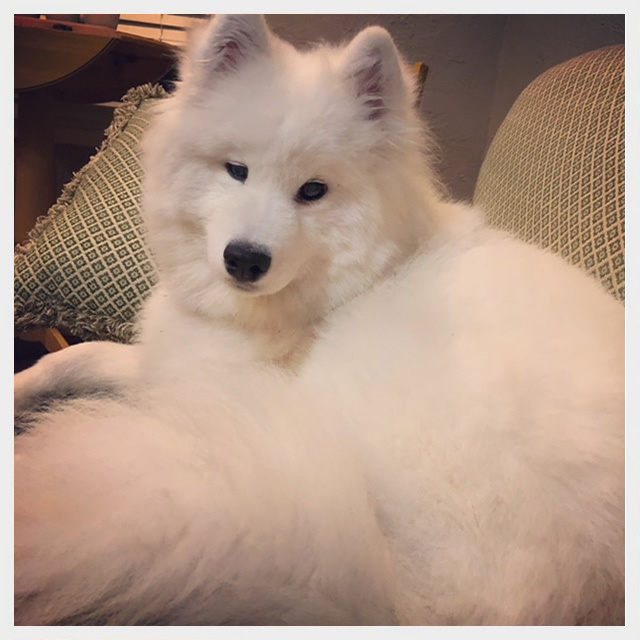 In the Summer of 2018, Izzy’s owner reached out to SLSR to help him rehome his Samoyed mix, Izzy. Izzy is a big girl, but very, very sweet. 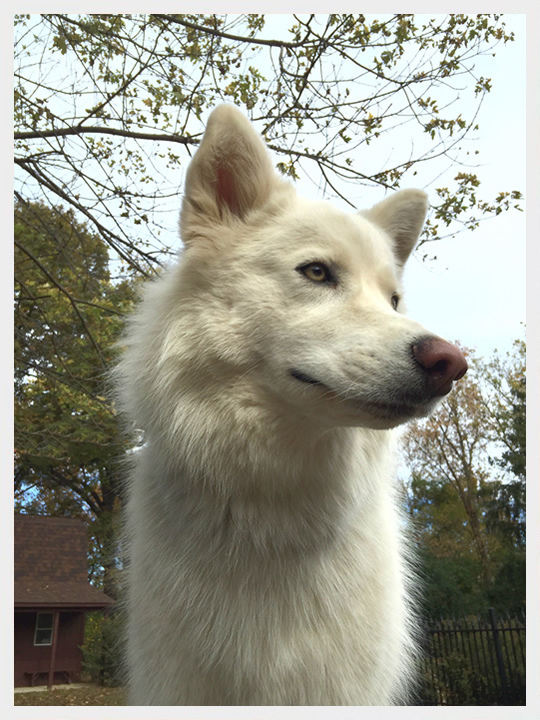 Izzy appeared to be a Samoyed and husky mix. SLSR, along with Playing Again Sams in Wisconsin and Denver Samoyed Rescue, were able to help Izzy’s owner search for a new forever home for Izzy. 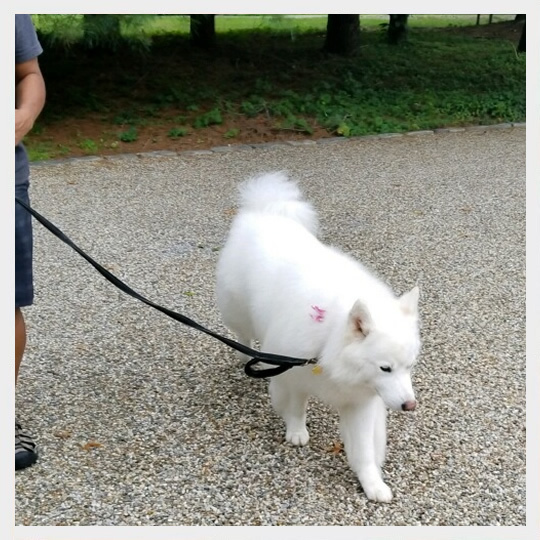 A couple from a few states away, who were experienced Samoyed and Samoyed mix owners, fell in love with Izzy. They passed the adoption vetting process with flying colors and drove to Illinois to adopt Izzy. Izzy is now enjoying being the queen of her castle in her new house and going for walks in the local park!